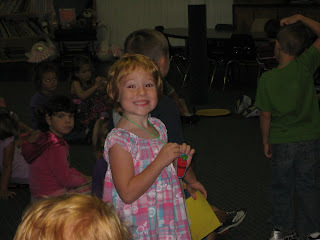 Meadowe has been in preschool for 1 week, officially. And she loves it! She's so excited to go, in part because her cousin Brendan is in her class, and she's such a big girl about it. Her teacher is waiting for her at the door and Meadowe greets her and then walks herself in and down the stairs to her classroom. I almost cried the other day watching her walk in all by herself. Images of her being a needy newborn and holding her in my arms not knowing what the future had in store or knowing what her personality would be like flashed through my mind. I can't believe she's come so far. She is so independent. She wants to do new things all on her own. I think she'll give anything a try once, but she's an awful lot like her Mama in that if she doesn't succeed right away, she gives up. I hope I can show her how to keep persevering. Her teachers say that she is doing a great job adjusting, and when we're riding back home she tells me how her morning was. She gets to bring home some of her artwork and other activities and Ora and I are impressed with her skills. She used watercolors to paint an apple and she paid very much attention to the details of the apple. I feel the need for a filing system coming on!!! Her artwork and activities, and soon Finn's artwork, will need to be preserved for sentimentality's sake! How will I ever decide what's important?! 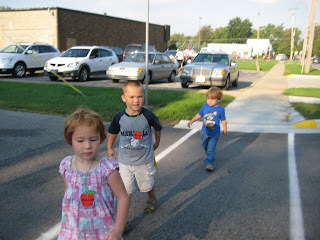 Finn is used to running with the big kids and thinks that he should be going to preschool too. 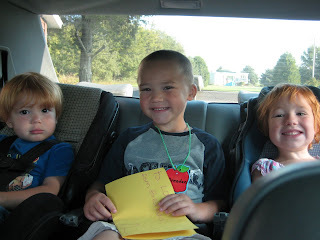 Every day so far when we've dropped Meadowe off he says, "I go pwe-skoow too!" 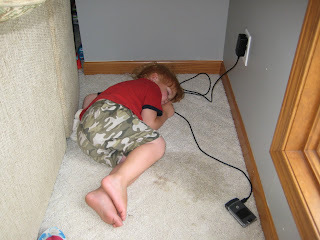 And I have to gently tell him that he will go to preschool, just not right now. I try to encourage him by saying that he now has Mommy all to himself for a few hours, but I'm not sure he is grasping the idea of Mommy/Son time yet. He likes having all the toys in the house to himself, this much I'm sure of. August seemed to race by! What happened? Where did summer go? Oh, right, we never really had a good stretch of summer. But we make do with what we are given, and God has given us a wonderful month. My, my! 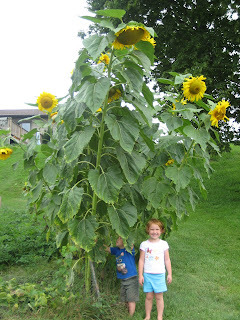 Aren't those some tall sunflowers! The first Saturday in August, I had the wonderful experience of going to World Pulse Festival, a Christian music festival in South Bend. 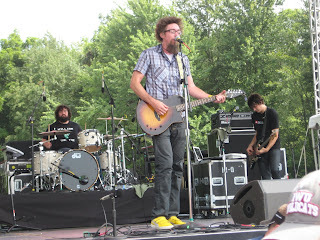 I got to see 5 acts, including my favorite group, the David Crowder*Band, pictured above. There are 6 members, but only 3 of them fit in the lense of the camera! They have some incredible songs on the radio right now and a new album coming out in a couple weeks. I was able to get up to the front row to watch this talented group. What a fun day! 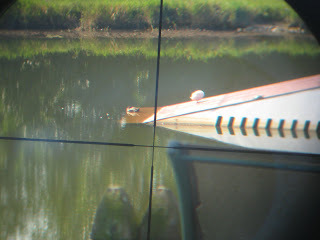 So, I love where we live; there is so much wildlife that lives in or visits our lake and property. Living at our lake is a pair of "resident ducks," as we call them. They're a couple of flightless ducks, they're never more than a few feet apart from each other, and they think they own the lake. They chase the mallards off at every chance they get. It's quite entertaining to watch. On this particular day, like many other days, the resident ducks were hanging out on the ski jump, bathing themselves in the shallow water at the base of the jump and just warming themselves in the sun. You can see a turtle also sunning himself partway up the jump. He's the little black spot on the near edge of the jump. On the warmest and sunniest days, there will be easily 30 turtles sunning on the jump. I like to find the biggest one and try to guess his age. I took this picture using the "sight" that's supposed to go on a rifle. It doubles as a great telescope, of sorts! 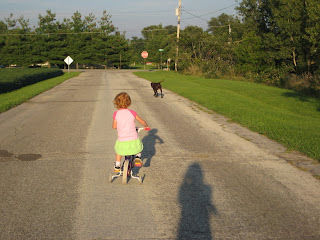 We had great weather in the evenings, so Meadowe, Finn, Murray, and I took a walk while Ora mowed the yard. Too bad he couldn't join us because we had a very nice walk. I say walk, but Meadowe actually rode her bike. She loves riding her bike! Murray just likes to go!